Not to be confused with Province of Brabant. 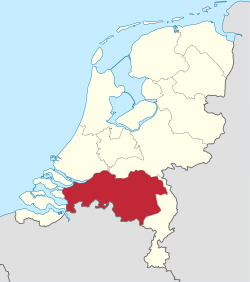 listen)), mostly called Brabant, is a province of the Netherlands, located in the south of the country, bordered by Belgium in the south, the Meuse River (Maas) in the north, Limburg in the east and Zeeland in the west. Until the 17th century, the area that now makes up the province of North Brabant was mostly part of the Duchy of Brabant, of which the southern part is now in present-day Belgium. In the 14th and 15th century, the area experienced a golden age, especially the cities of Leuven (Louvain), Antwerp (both now in Belgium), Breda and 's-Hertogenbosch. In 1815, Belgium and the Netherlands were united in the United Kingdom of the Netherlands, and the province of North Brabant was established and so named to distinguish it from South Brabant in present-day Belgium, which seceded from the Kingdom in 1830. This boundary between the Netherlands and Belgium is special in that it does not form a contiguous line, but leaves a handful of tiny enclaves (and enclaves inside enclaves) on both sides of the border. A few of these irregularities were corrected (Luyksgestel was exchanged for Lommel), but some remain, notably Baarle-Hertog. The period from 1900 till the late 1960s is called Het Rijke Roomse Leven (translated as 'the rich Roman life', with 'Roman' meaning 'Roman Catholic'), a religious and spiritual awakening. Het Rijke Roomse Leven came about as result of the emancipatory drive of the province's disadvantaged Catholic population and was supported by a Roman Catholic pillar, which was directed by the clergy, and not only encompassed churches, but also Roman Catholic schools and hospitals, which were run by nuns. In those days every village in North Brabant had a convent from which the nuns operated. Politically, the province was dominated by Catholic parties: the Roomsch-Katholieke Staatspartij and its post-war successor, the Katholieke Volkspartij, which often held around 75% of the vote. In the 1960s secularisation and the actual emancipation of the Catholic population brought about the gradual dissolution of the Catholic pillar, as church attendance decreased in North Brabant as elsewhere in Western Europe. The influence of Het Rijke Roomse Leven remains in the form of education still being Roman Catholic (today it is run by professional teachers rather than nuns) and in North Brabant's culture, politics, mentality and customs, such as carnival. The province still has a distinct Catholic atmosphere when compared to the provinces north of the major rivers. The provincial council (Provinciale Staten) has 55 seats, and is headed by the Queen's Commissioner, currently Wim van de Donk. While the provincial council is elected by the inhabitants, the Commissioner is appointed by the Queen and the cabinet of the Netherlands. With 12 seats, People's Party for Freedom and Democracy is the largest party in the council, closely followed by Christian Democratic Appeal with 10 seats. The daily affairs of the province are taken care of by the Gedeputeerde Staten, which are also headed by the Commissioner; its members (gedeputeerden) can be compared with ministers. Like most of the Netherlands, North Brabant is mostly flat but nearly every part of North Brabant is above sea level, therefore there are not as many canals as in the lower parts of The Netherlands. While most of the population lives in urban areas, the province is scattered with villages and most of the land is cultivated. Consistent with naturally raised areas, forests, heathlands and dune areas can also be found. The province is bordered by the Meuse River in the north. Its delta flows through the Biesbosch area, a national park. Employment is found in the agricultural, industrial and service sectors. The main agricultural products are wheat and sugar beet, while cows and pigs are held as livestock. The chief industries are automobile production, electronics (both mainly in Eindhoven), textile and shoes. In the twentieth century, tourism has become an important sector for North Brabant, the woods and its quiet atmosphere combined with the beauty of some of the cities having proved successful. Another big tourist attraction is theme park Efteling in Kaatsheuvel, the largest of the Benelux. This page uses content from the English language Wikipedia. The original content was at North Brabant. The list of authors can be seen in the page history. As with this Familypedia wiki, the content of Wikipedia is available under the Creative Commons License.